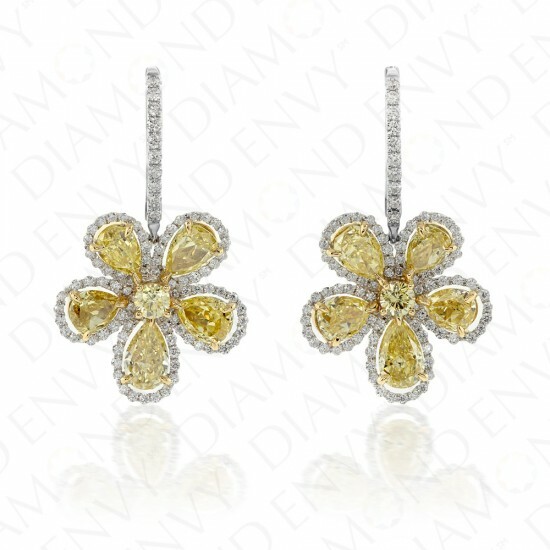 These Fancy Intense Yellow diamond earrings offer a measure of irresistible charm and are oh so perfect for springtime or anytime you need some warm happiness. Each 18K two-tone gold earring consists of five VS1-SI1 pear-shaped Fancy Yellow diamonds to Fancy Intense Yellow diamonds that align in a flower-shaped formation. 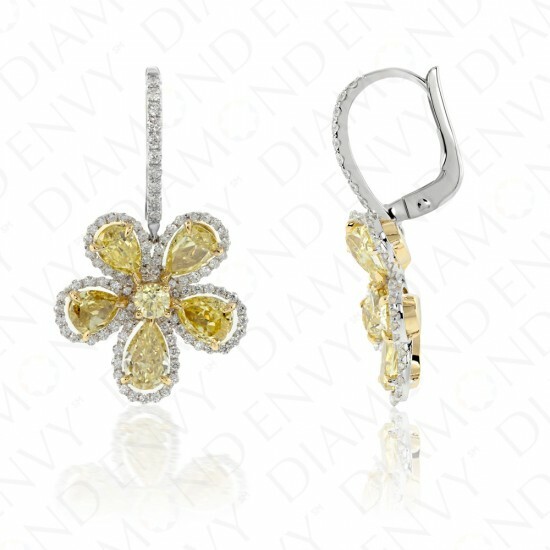 Each yellow diamond petal is framed by a white diamond halo of F-G VS2-SI1 accent diamonds, which also adorn the leverback hook. A VS2-SI1 round Fancy Yellow diamond forms the nexus. Pear-shaped yellow diamonds total ten pieces, 4.66 ct. tw. Round yellow diamonds total two pieces, 0.78 ct. tw. White accent diamonds total 182 pieces, 0.84 ct. tw. Gold weight: 7.75 grams. These canary diamond earrings are house-graded.